This Spanish-language portmanteau film paints a picture of contemporary life in the Cuban capital through seven tragic-comic short films which unfold over the course of one week. All of the segments are written by the Cuban novelist Leonardo Padura Fuentes and each of them is directed by a different international filmmaker. In the first, ‘El Yuma’ (directed by Benicio Del Toro), a young American tourist is given an unconventional tour of the city by a taxi driver. ‘Jam Session’ (Pablo Trapero) follows a filmmaker (Emir Kusturica parodying himself) suffering an emotional breakdown while collecting an award at the Havana Film Festival. ‘La Tentación de Cecila' (Julio Medem) finds a beautiful Cuban singer (Melvis Estévez) torn between leaving the island with a Spanish impresario/lothario (Daniel Brühl) and staying put with her boyfriend. ‘Diary of A Beginner’ (Elia Suleiman) has a Palestinian named ES (Suleiman himself) wandering the streets while waiting to interview President Castro. ‘Ritual’ (Gaspar Noé) sees an African-Cuban girl being put through a ‘cleansing’ ceremony to rid her of her lesbian passion. ‘Dulce Amargo’ (Juan Carlos Tabío, the sole Cuban director) concerns a behavioural psychiatrist who offers lifestyle advice on television but whose own domestic life is a mess. And in the final segment, ‘La Fuente’ (Laurent Cantet), an elderly woman has a vision of the virgin and implores her neighbours to build her a shrine to celebrate. Inevitably, some of the segments – which are linked by music, views of the sea, those ubiquitous old cars and occasionally reappearing characters – are better than others. Suleiman’s is by far the most fully realised cinematically and the snapshot of the city that best captures day-to-day life in Havana. 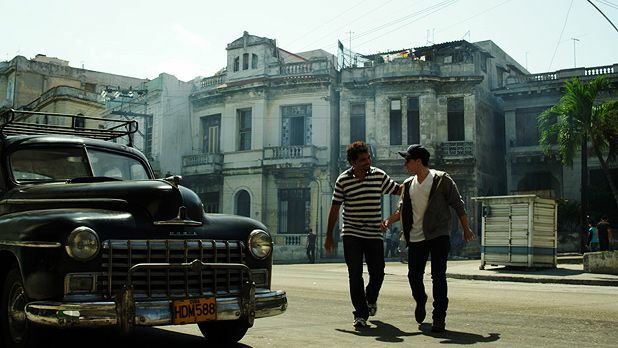 Together, however, the seven films present a rich, vivid and pointedly non-stereotypical view of the energetic and diverse culture of the Cuban capital. Selected release from Fri 6 Jul. Seven tragicomic short films by seven international directors sketching contemporary life in Havana, all of them written by Cuban novelist Leonardo Padura Fuentes. Inevitably, some are better than others but together they're a rich, vivid and non-stereotypical portrait of the Cuban capital.